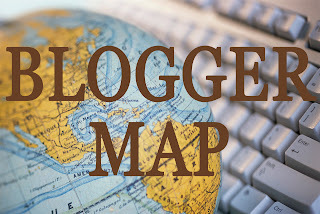 everydaymatters: I Finally Did It! I was so excited the other night when I was making guacamole. I am a huge avocado fan, but always have the hardest time getting the seed out. It's practically impossible for me to pit an avocado without ripping the whole thing to shreds. I have a hard time getting decent avocado slices because of the stupid seed. I was watching Iron Chef America a few weeks/months ago and saw one of the chefs pull the seed out by hitting it with the blade of his knife. So obviously I thought I could do the same thing. I'm basically an Iron Chef after all, I've spent enough time watching it. We had a Cinco de Mayo dinner at the beginning of May and I was making guac then. Megan was over and I kept trying to hit the seed with the blade and nothing was happening. 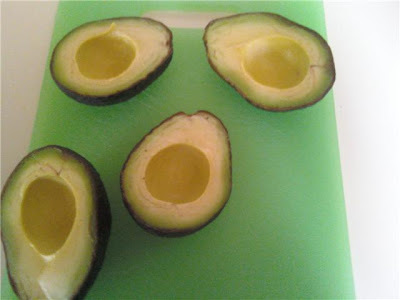 So, without any other choice, I destroyed the avocados trying to get them out of the skin and into the bowl. Well, the other night we were having taco salad for dinner (yes, we do have Mexican cuisine quite often) and I finally did it. 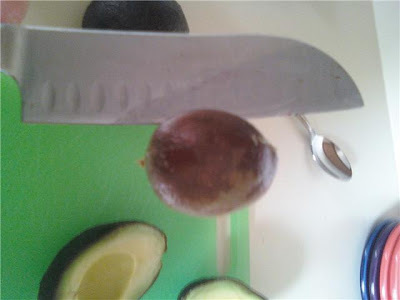 I got the seed out of both of the avocados I was using with the blade of my knife. I was so excited, and wouldn't it just figure that when I can finally do it, no one is around, and Joshua was sleeping. So here you go, admire my accomplishment. Check out those perfect halves. Our Wedding Got Us The Coolest Stuff!